For the 2005 season, Vancouver Island’s Pacific Rim region shows as much promise as the spectacular 2004 season, with a great outlook for both fish stocks and their related angling opportunities. The ardent early season anglers can expect excellent action for Chinook salmon and Halibut among the baitfish rich banks offshore from Tofino and Ucluelet. These mixed stocks of “transient” Chinook salmon are the mainstay of the winter and springtime fishery. Fishing at Tofino’s Portland or Raphael pts, in 140-160 ft. of water, as well as Ucluelet’s South bank and La Perouse bank in the 180 to 300 ft range, your efforts should be rewarded. Halibut are consistently found along these same banks, attracted by the vast schools of Needlefish and Sardines that have helped slow the Chinook salmon from their migration. As the 2005 season progresses to early summer, the Pacific Rim region will see a strong return of Chinook and Coho Salmon to both the protected inshore, and open offshore waters. This season will also provide unlimited action for offshore anglers, as millions of Pink Salmon migrate down the West Coast. This time of the year provides anglers of all ages and gear types, to enjoy great rewards. The last stretch of the summer season provides the best opportunies for Chinook in the “Tyee” class, with the 2005 outlook for hatchery origin Springs showing great returns. The islands and reefs that scatter along the outer coastline are the traveling and feeding corridors for these maturing Salmon en-route to their natal streams. Try the Tofino area Hot Spots like Wilf Rock, Blundan Island or Tree Island. Ucluelet’s Wya Point, Little Beach and the “Grapefruit” are all close to town, and produce the area’s most mature Chinook. As in the past few years, you might consider the offshore areas to continue to produce the “Slabs” as well. Anchovies or Medium Herring 6-7 ft. behind a flasher will often be the gear of choice. Many anglers have also been relying on 7 inch spoons like Oki’s Titan, or Gibb’s Gator in glow patterns. The late season months of September thru November should not be ruled out, as there are great opportunities for the largest and most aggressive Coho Salmon of the season. Island anglers may consider visiting the area to experience this great fishery, as you do not require a large boat or to travel great distances. This time of the year still provides great offshore action for Halibut and Bottom fish, as well as a strong outlook for Chum Salmon later in October. If you have not already, you should consider trying this exhilarating late season Salmon fishery. For more detailed information on the timing and opportunities in our area, stop by or call us at the West Coast’s only Fly & Tackle. For Moorage in the Tofino area, call the Tofino Harbour Authority at (250) 725-4441. 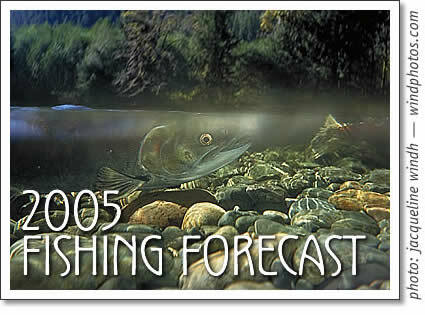 Tofino fishing forecast for 2005. Fishing outlook 2005 by Tofino fishing guide Jay Mohl for Tofino Time magazine.